Redbud Development Inc. is a landscape design and construction company specializing in the custom design and quality installation of residential improvement projects. With a creative and collaborative approach, their designers help clients imagine and build outdoor living environments that connect seamlessly with the interior and reflect their personality and lifestyle. Pools, outdoor kitchens, stone patios and wooden structures are just a sampling of features they can utilize to help you create a functional retreat to better enjoy your favorite pastime whether that is entertaining friends, exercising, getting closer to nature, etc. They can also help you with interior renovations to your kitchen, bath, mudroom, walkout basement, etc… Sometimes an adjustment to an interior space is needed to greatly improve the use and aesthetics of the outdoor space. What do you like most about your property? What do you dislike? How do you want to spend time in the landscape? What is the goal? To relax? To play with kids? To entertain? How often do you entertain and for how many people usually? 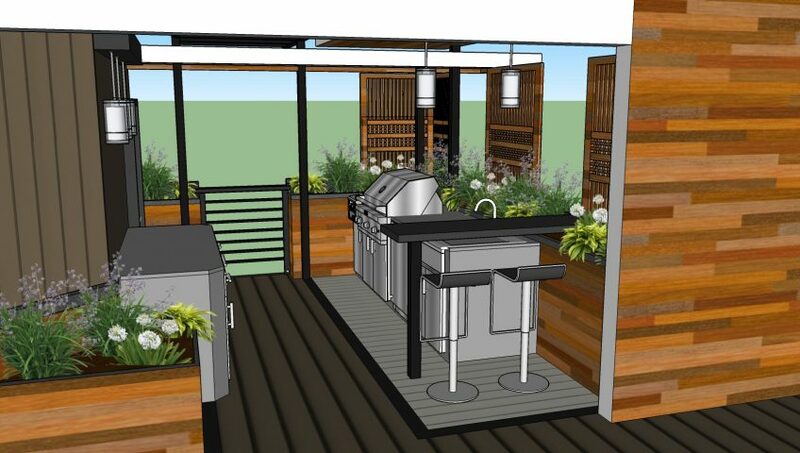 A good designer will look beyond the immediate areas of interest (pool, patio, outdoor kitchen, etc.) and they will consider the inside of the house and how it relates to the exterior. The layout of your house, the traffic flows, the door and window locations, even the location of the restroom – these can all impact the design of your yard or outdoor living space. Understanding both your lifestyle and your sense of style will result in a more pleasing and functional property. Good design takes time! Start NOW for a spring or summer construction project. The design process and potential permitting process can take several months depending on the scope of your project. Invest in a plan that will identify and solve difficult site issues and save you money on construction. As licensed professionals, they are up to date on industry trends and products and can work with your architect, engineer or other design professionals. Redbud works with a trusted network of subcontractors which allows them to be very flexible and operate in a wider geographical area. Their high level of service is designed to take away the hassle and headache normally encountered when dealing with the permit and variance process, local code enforcement and multiple contractors. On the design side, they will maximize the functional and aesthetic value of your property. On the project management side, they manage the budgets and sub-contractor scheduling, help you with the material selection and make sure it all gets done right the first time to the highest quality standards. design/build firm on Long Island, where he broadened the scope of his knowledge significantly and attained the professional title of NYS Registered Landscape Architect in 2004. Geffrey has worked in nearly every level of the industry over the past 25 years. He has also served as board member of the Capital Region Builders & Remodelers Association. Karen has a B.A. degree in International Language/Business and an MBA in Finance. She has a business background that ranges from small Import/Export companies to working in Human Resources, Accounting and Finance for several large banking institutions in New York City. Gary Diehl joined the Redbud team as a draftsperson in September 2012. Gary is now the head of the production department and is also the lead project manager. Gary has an AAS degree in Mechanical Technology and a Drafting Certificate from SUNY Adirondack. Jessica Robbins joined the Redbud team in the spring of 2016 as a landscape designer. She is a graduate of Clemson University with a BA in Landscape Architecture. She is extremely creative in her approach to design and she produces the most beautiful computerized 3D drawings that really help clients to envision the completed project.